Pretty Mike a few days ago was accused of being Bobrisky's bae after the cross dresser shared a picture of himself and his alleged bae who everyone assumed to be Pretty Mike. 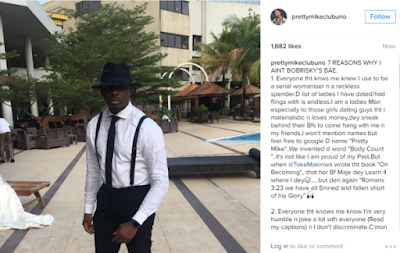 Pretty Mike has however come out to debunk the rumours on the grounds that he is a serial womaniser, thus cannot be Bobrisky’s “bae”. 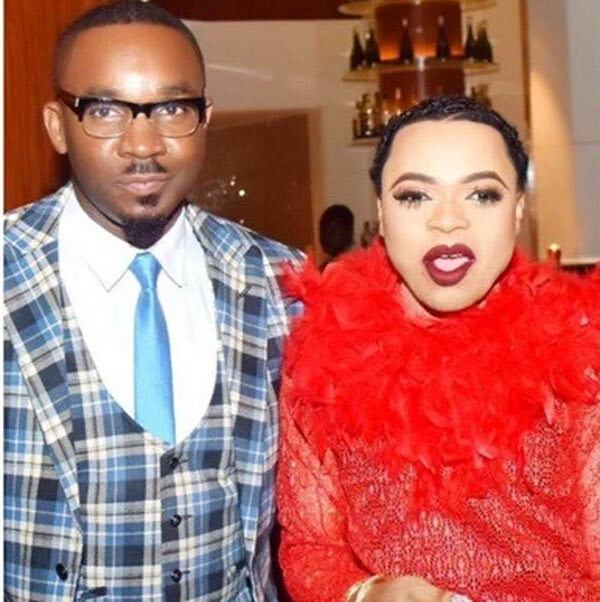 He also admonished everyone to “stop judging Bobrisky because of his looks and sexuality”. 7 REASONS WHY I AINT BOBRISKY’S BAE. 5. How could y’ll (especially all u amateur blogs)post such a story just cause some idiot said it? I expect y’all to make ur findings n support it wth concrete evidence instead of rushing to post such a senseless story.This is why I still feel@Instablog9ja is d best,dey don’t post ridiculous stories without proof,and I read sme of d comments,especially d ladies looking at my picture n saying “what a waste of fine boy” well u were all right, I’m a waste, my Cassava has retired cause I’m in a serious relationship now.